Why all models of Domino A Series Printer use nozzle plate with thickness of 2.5mm? Nozzle blocking is a question concerned by all users. Regarding to CIJ inkjet printer working theory, nozzle blocking is easily generated, because 90% of the ink used in CIJ inkjet printer is fast dried. Most of the manufacturers of industrial inkjet printer announce that their CIJ printers are equipped with function of self cleaning, however, nozzle blocking problem is still 100% solved. 2. Insert a customized gem into the hole, then the nozzle plate is well made. 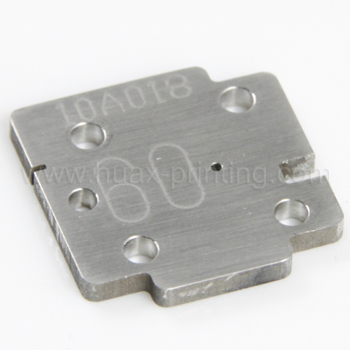 This kind of nozzle plate is particularly owned by Domino A Series Printer. There are two kinds of gem used in Domino nozzle, sapphire and ruby. Domino nozzles made by sapphire are of higher quality than those made by ruby, and with longer service life. The Domino nozzles produced in Huax Tech are all made by sapphire, thus please feel free to use our Domino nozzles. When installing Domino nozzle plate, fix the whole stainless steel sheet on Domino Drop Generator with 4 screws, and seal it with special O ring to prevent from ink leaking. For Domino nozzle which hasn't been used for long time or has been seriously blocked, just remove it from the printer and dip it in the solvent, then use ultrasonic to shake and clean it. Normally the nozzle could be wonderfully cleaned, and it is very convenient. After finishing the cleaning, it is also very easy to install and adjust. Domino A Series Printer will carry out the self cleaning function with the startup and shutdown process. Each cleaning will extract rated solvent. If the extracted solvent volume is too big, the ink will be dilutted to be lighter, which will finally lower down the ink viscosity. Thus, the frequency for startup and shutdown of the Domino Printer should be strictly limited to prevent the ink from being of low viscosity, which is caused by frequent self cleaning. Compare with plunger nozzle, the 2.5mm gem made nozzle plate is easier to clean absolutely. Note: More technic informaiton on what kind of nozzle plate is applied in Domino A Series Printer, please feel free to contact with Huax Tech.